As Pongal festival (Uzhavar Thirunaal) is nearing I wanted to post healthy (millet) pongal recipes. This varagu pongal is very easy to prepare, tastes delicious and also very healthy. There is not much difference between rice pongal and this pongal. It can be had for breakfast or for dinner also. Millets are rich in fiber, low in cholesterol and are gluten free. You can read more about the health benefits of millets in my how to cook millet post. Today we will learn how to make Ven Pongal with varagu (kodo millet) following this easy recipe. Dry roast moong dal until it is hot to touch. You do not have to roast millet. Wash and pressure cook both dal and millets with 2 1/4 cup of water, salt needed for 4 whistles. Heat oil in a kadai/pan, add cumin/jeera seeds, pepper and cashew nuts, when jeera sizzles, add finely chopped ginger, curry leaves and pour it over the cooked millet + dal. Cook the pongal on low heat for 3-4 minutes, add ghee and switch it off. Delicious and healthy Kodo Millet Pongal is ready. Serve it hot with sambar or coconut chutney or coconut chutney with garlic. Note - You can substitute kodo millet with little millet (samai) or barnyard millet (kudraivali) and prepare the same recipe. 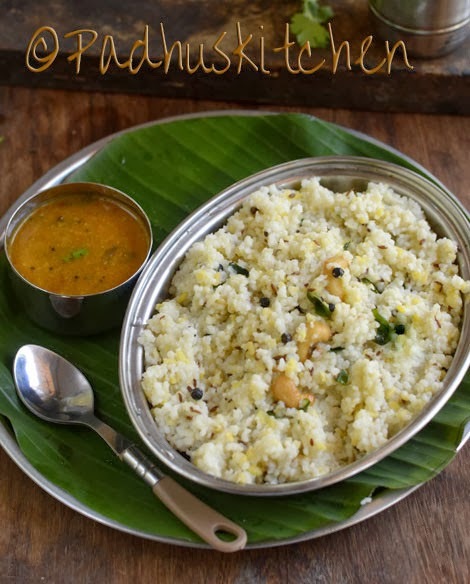 Check out more Pongal Festival Recipes, side dishes for pongal etc. looks yummy! love your recipes padhu. where do you buy Varagarisi in USA? I do not know about USA . Here in India we get everything in super markets and health stores. There is not need to soak varagu rice otherwise I would have mentioned it in the recipe. Is it ok to mix all 6 millets and use it in all recipes? I have taken equal quantities of all millets except ragi / finger millet and mixed them together and mix it with red rice / brown rice and use it with sambhar. Is it ok? Kindly advice. If a person is allergic to one millet, you will not be able to find out which millet it is. Make sure that no one has any problem in you home with any millet. Then mix it and keep it. You cannot make sambar. But you can make sambar rice, khichdi, pongal with mixed millets and dal. Is it ok to use samai millet firvthis recipe? You can substitute with any millet.